It is time to prove to me that my tutorials are not in vain! Below is a write-up I saw on Facebook, spiced with glaring errors that cannot be overlooked in English. I want you to state and correct them using the comment box on the blog. The number of errors you are able to spot will determine the weight of the token you will receive from Tammy's English blog. 1. Do not comment twice or multiple times. 2. All comments should be made on the blog. 3. If you must comment as "anonymous", don't fail to include your name, email address and phone number. 1. Family is not what it used to be. 2. Now everbody chooses who they want to deal with. 3. Cousins talk about one another like they are not flawed. *Brother's and sister's... Instead of "Brothers and sisters"
*It use to be a time ... Instead of "used to be"
*...and just have a good time... Instead of "and just have good times"
*Now everybody choose who... 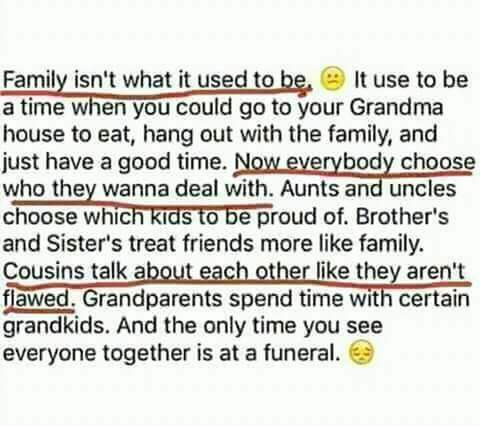 Instead of "Now everyone chooses who"
Enter your comment...Family is not what it used to be. There used to be a time where you could go to your grandma's house to eat. Brothers and sisters treat friends more like family. Cousins discuss one another as if they are not themselves flawed. 3.Cousins talk about one another like they've got no flaws. 2. Now, everyone is choosing who they want to deal with. 3. Cousins talking​ about each other like they are not flaws. 3.you could go to your grandma's house to eat. Family isn't what it used to be. there used to be a time when you could go to your grandma's house to eat, hang out with the family and have a good time. 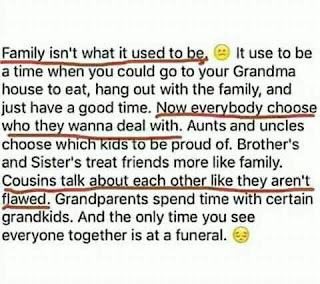 Now, everyone chooses whom they wants to deal with, Aunts and Uncles chooses which kids to be proud of, Brothers and sisters treats friends more like a Family, Cousins talks about each other like they aren't flawed, Grandparents spends time with certain Grandkids and the only time you see everyone together is at a funeral. May God continue to bless you Tammy. keep on your good work.